"Enter the True World. Marvel at the jungle's lush greenery, the desert's shimmering sands, the birds' jewel-toned plumage, the people's gentle demeanor. Beware, though, the dark side of this beauty: the gods of this place are very much alive, and their troubles are the people's troubles. Set in the countries first described in the Maztica trilogy of novels, this campaign set provides players and DMs with all the information necessary to recreate the storyline of Ironhelm, Viperhand, and Feathered Dragon, or to build a campaign of their own. Four new character classes, Eagle Knights, Jaguar Knights, plumaweavers, and hishnashapers, add to the mystique of Maztica. 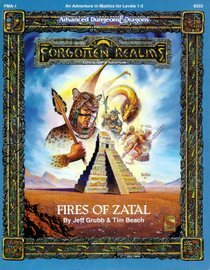 New magical spells and items, new deities, new proficiencies all add to the flavor of this setting loosely based on the Aztecs and Mayans of Central America. * Four poster-size maps showing the True World and Cordell's voyage from the Sword Coast to Maztica's shores, as chronicled in Ironhelm." "On the Night of Wailing, when the creatures of Viperhand come to life, when the great Maztican gods Qotal and Zaltec battled, the great Cloak of One Plume -- a magical item of great power and a token of great authority -- was believed lost forever. Rumors fly that the Cloak was rescued that night, and hidden away in a safe location. Now a petty noble of New Amn plans to recover it, and is looking for brave young souls who can bring it back to him. But other players are invovled in the chase, trying to recover the lost Cloak. Fires of Zatal spans the great continent of Maztica from the new colony of Helmsport to the Valley of Nexal, at the foot of Mt. Zatal itself. It is the first adventure for the new Maztica campaign setting in the Realms; DMs wishing to run this need the Maztica Campaign Boxed Set. This module serves as an introduction to this new world of adventure, a land of wise and savage empires and growing, monstrous threats. Welcome to Maztica. This is not the Realms you're familiar with!" "Deep within the heart of the jungles of Far Payit is a city lost to time and the modern people of Maztica. Long ago abandoned by its people, it holds a deadly secret deep beneath its ruined surface, a secret held safe by a tribe of inhuman guardians. A secret that has remained inviolate until now. A cleric of the church of Helm has disappeared. 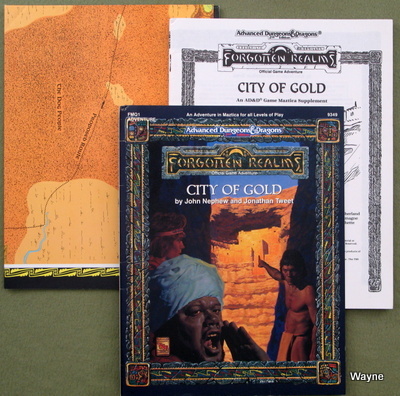 A piece of a map to the lost city of Ixtzul has been found. Great armies of ants perform deadly assassinations. And in the jungle, a new leader has appeared, promising power to those who follow her into the forbidden vale. Now the heroes must follow as well, to uncloak the mystery and prevent the unleashing of a deadly force on the surface world of Maztica, a force that threatens both people of Payit and the newcomers' civilization in Helmsport. Should the heroes fail to defeat the endless armies of their foe, all in Maztica will perish!" "Somewhere in the True World, to the north of the lands you know, lies the City of Gold: Michaca. It is a city of legend, of fable, and of wonder. The journey is hard, and the perils are many; you know, however, that the rewards will far outshine any treasure you have ever seen. 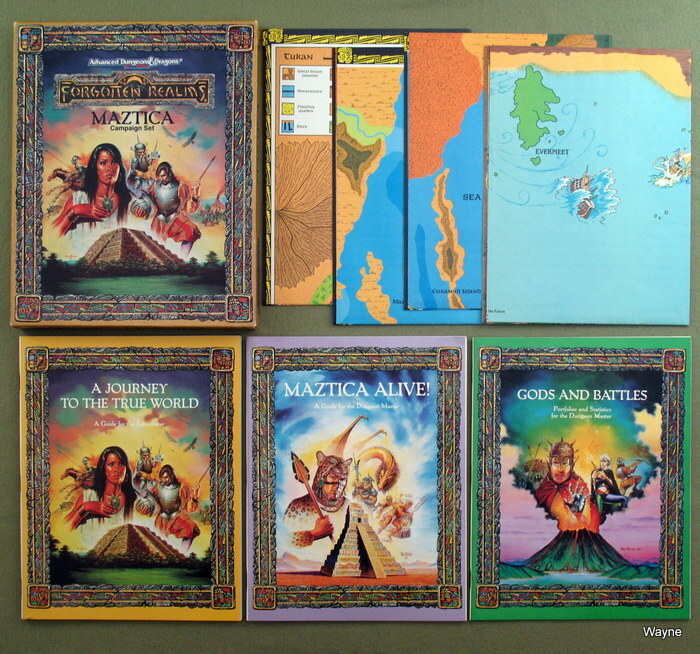 This supplement for the Maztica Campaign Setting is a new type of product: a combination adventure and accessory. In this booklet you will find information on a new character race, the Azuposi; on new character classes for rogues, including the clown (or koyemshis); on new priest classes, including the 'bent priest'; and a new magic unique to Maztica, fetishism. The adventure itself leads your party from the known areas of the True World into the northlands, through the lands of the desert dwarves, the Poscadar elves, the Dog People, and others. Your characters will deal with desert hardships they have never endured before. They will also confront spirits they've never heard of: The spirits that have caused the downfall of Michaca, the City of Gold. And do not forget the words of a poet of another place, and another time: 'Nor all that tempts your wand'ring eyes / And heedless hearts, is lawful prize; / Nor all, that glisters, gold.'" 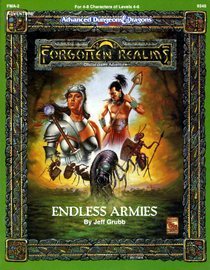 Wizards of the Coast owns (and holds trademark to) the AD&D game and the Forgotten Realms in all forms.